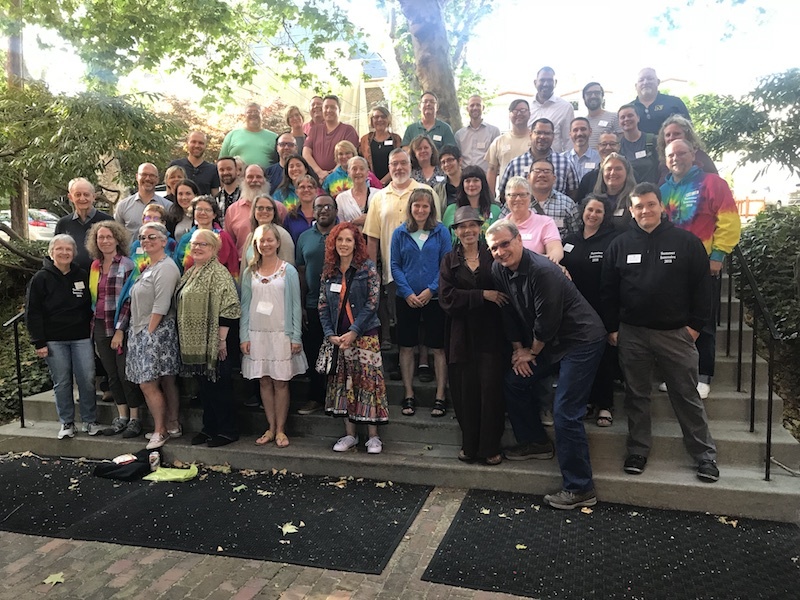 Just before CDSP’s academic year for residential students began on September 4, Academic Dean Ruth Meyers paused to reflect on last June’s summer intensive and what the year ahead will bring. This year marked the eighth summer intensive at CDSP. How did it go? This summer was the first time that we had a full complement of low-res MDiv program students on campus together. Our low-residence MDiv is a four-year program that requires four summers, so our first major cohort was here for their fourth summer along with students in their first, second and third summers. We’re finding that the summer program also brings in some of our residential students and students from across the GTU (Graduate Theological Union). All together this summer, we had 59 students on campus. Chapel and the refectory felt wonderfully full and full of enthusiasm–it’s wonderful to have all of those students together. This first large cohort of low-residence MDiv students will graduate in May, and the program continues to attract both MDiv and Certificate of Anglican Studies students from across the church who want a seminary education but cannot relocate for three years. For the first time this summer, the low-residence students adopted a long-standing CDSP tradition by putting on the Follies [an evening of comedy presented by residential students each spring]. Despite all of the press of work during summer intensive, they organized a fun evening of skits. It suggested to me a wonderful sense of ownership of the CDSP experience and an equal status with residential students. The faculty contributed a song based on the hymn “Come Labor On.” We called it “Come Labor More,” and included a number of creative ideas about how to make students work even harder! This year, the August faculty retreat continued the work with the Intercultural Development Inventory (IDI) that you began in January. How did it go? Thanks to a grant from the Wabash Center for Teaching and Learning in Theology and Religion, we’re able to continue working with the IDI, which is a way for people to develop themselves as intercultural people and interact effectively across cultural difference. We see the IDI as a key tool for clergy and lay leaders today given the changing demographics of the United States and as a component of addressing systemic racism. We’ve been using the IDI to help individuals understand their own level of intercultural competence and then develop a plan to build it. This year, we’re also working on integrating this focus on intercultural competence into the curriculum and offering students the opportunity to develop their own plans. Last year, we piloted this approach with the senior Issues in Ministry class, and this year, first-year students will use it in their Foundations for Ministry course, and others will use it in the Leadership for Ministry course and possibly also field education. From there, we think intercultural competence will bubble through the curriculum. What else is new this academic year? Rabbi Daniel Lehmann is the new president of the Graduate Theological Union (GTU), and he’s bringing in some creative thinking about how we interact with other GTU schools programmatically. CDSP Dean of Students Andrew Hybl is working with other deans of students to develop a GTU-wide social committee to encourage interaction among GTU students. In late August, CDSP hosted the GTU Welcome BBQ in St. Margaret’s Courtyard. The first residential class to go all the way through the new MDiv curriculum will graduate this year, so they are the first group of students to take the new two-semester Leadership in Ministry class, and the first to have a second year of field placement. Low-residence MDiv students on the accelerated track will also be part of the Leadership in Ministry class alongside their residential peers. These curricular changes are built on the action-reflection model of learning. Students learn in the classroom, then they work in a congregation, then they bring back what they’ve learned to the classroom again. It’s an iterative process, and it allows contextual learning to take place. Professor Julián Andrés González Holguín is on sabbatical this fall. He has a Conant Grant to support his writing of a book chapter for “The Cambridge Companion on the Hebrew Bible and Ethics.” The chapter is about the connection between Christian ethics and the Hebrew Bible and will inform his research on human rights and migration as hermeneutical frameworks to interpret the biblical text. I will be on sabbatical during the spring semester, and I also have a Conant Grant. I will be studying worship in culturally diverse and multiracial congregations in the Episcopal Church, and will travel to culturally diverse congregations, worship with them at their principal Sunday services, and interview their lay and ordained leaders and members.